With a name like ours, you’ve got to figure we’re all about growth opportunities. We offer you more in return for your energy and commitment by providing a three-dimensional environment centered on your development, personally and professionally. And, not to toot our own horn, but we were recently recognized nationally as a Top 100 Workplace by Fortune Magazine. Learn more about Grow Careers. Grow Financial is committed to meeting the banking and financial services needs of all our members. We aim to promote accessibility, diversity and inclusion. Our goal is to provide an accessible and barrier-free environment in our banking locations and we strive to make our technology accessible and continuously work on accessibility improvements to our website. Read our Website Accessibility Policy. We have adopted this policy to support our commitment to the accessibility of this website and to users with disabilities. Please be aware that our efforts are ongoing. The products and services described on this website are offered only in the United States. 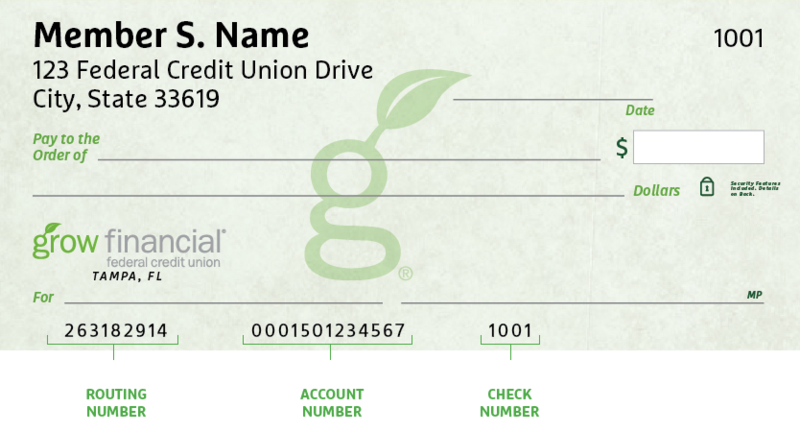 Your personal checks include both our routing number and your account number, as shown on the Grow check example below. Don’t have a Grow check? No worries. Visit any Grow store and ask for a Direct Deposit Form. It lists both your routing number and checking account number. Nobody likes paying bills. We get it. That’s why at Grow, we make it as painless as possible to pay your loan every month. You can even choose how to do it. You have two ways to pay by transferring funds online from another institution. We accept both Mastercard® and Visa® debit cards and ACH. With debit cards you’ll also pay a convenience fee of $4.95. To make a loan payment other than your mortgage or Grow Visa® credit card, click the button below. You can make one-time payments or set up automatic recurring payments in your Grow Online Banking account. Simply select “Transfer/Payments” from the menu. And if you’re not enrolled in Grow Online Banking, you can set up your account in just a few minutes. You can also pay your loan by check through the mail. Please remember to include your account number and Grow loan number on the check. At certain places on this site, there are links to other websites. Grow Financial Federal Credit Union does not endorse, approve, represent, certify or control those external sites. The credit union does not guarantee the accuracy, completeness, efficacy, timeliness or accurate sequencing of the information contained on them. You will not be represented by Grow Financial Federal Credit Union if you enter into a transaction. Privacy and security policies may differ from those practiced by the credit union. Click CONTINUE if you wish to proceed.